The Dentists Disability Insurance Plan was designed with the understanding that dentistry is a specialty occupation and, therefore, those working in the dental trades often need high limit disability Insurance. Unfortunately, because this is usually a highly compensated line of work, dentists often find it difficult to obtain sufficient amounts of disability insurance from traditional carriers. Dr. T who chose to cut back on his work hours in order to have more family time. This resulted in his not being able to exercise his Future Increase Option on his two traditional Disability policies because his income had not increased sufficiently. Now the children are off to college and Dr. T has returned to full time practice. He needs more Disability Insurance, especially during the children’s college years. Since he missed out on using his Future Increase Options, who besides Petersen International Underwriters would issue more Disability Insurance to Dr. T? Disability insurance is the cornerstone of a secure financial plan. A disability resulting in your client’s inability to return to work would be financially ruinous if sufficient insurance coverage is not in place. 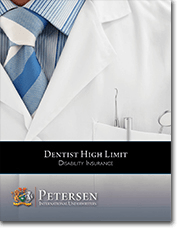 Petersen International Underwriters designed the Dentists Disability Insurance Plan to provide men and women working in the dental profession with the amount of income coverage they require. This plan allows dentist professionals to maintain their standard of living in the event that a disability leaves them unable to work. With issue limits of $100,000 per month (or more) and participation limits up to 75% for personal disability and 100% for business uses, our Dentists Disability Insurance Plan will provide your clients proper income replacement. In the event of an accident or debilitating disease, our Dentists Disability Insurance plan will keep your clients safe. PIU is here with all the information you need. We will help you expertly explain disability plan options to your clients and get them covered adequately.